Welcome back to another chair-spinning, semi-improvised and real time look back at the last seven days in TV. We start with the aforementioned chair spinning as The Voice UK returns for its fourth series. The biggest change to this series has to be the inclusion of a new judge, sorry coach, in the form of Rita Ora. Of the three female coaches to grace those Voice UK seats I feel I knew the least about Ora however I felt that she proved herself to be an endearing and honest part of the panel. In fact, I felt at times that Ora was better at providing constructive criticism to unsuccessful contestants than her male counterparts were. I do feel that one of the problems that The Voice UK has is that it tries to be the ultra-nice show to make it stand out from its nastier ITV rivals. However, I believe that it's gone too far the other way and when no coach turns around for an act they fall over themselves to apologise for the fact. So, for example, when Kym Marsh's daughter Emilie failed to secure herself a coach only Ora was on hand with some advice; namely to try and decide what sort of artist she wanted to be. Emilie's appearance also highlighted the fact that the occasional Voice UK audition is simply to garner some publicity for the show. Similarly the appearance of Paul Cullinan, who played Bungle in Rainbow, was never going to result in the discovery of a major recording artist but did make for a pleasant interlude amongst the serious contenders. Although I feel I must to call foul play on Cullinan's claims as he wasn't one of the Bungles from the original series that you and I remember but instead portrayed the bear during the dismal mid-1990s reboot. Bungle aside, the talent on The Voice UK has always marked it out from his contemporaries because; in the words of Rita everyone can sing. My personal favourite had to be the final act; fireman Stevie McRorie whose smooth Scottish tones provoked all four coaches to turn their chairs. Stevie also caught the attention of Rita for other reasons and the way in which she swooned over him was a little too over-the-top for my liking. Opera singer Lucy O'Byrne, who currently works as an usher on the West End, was similarly outstanding as her fantastic vocals piqued Will's interest. I personally was also a fan of Hannah Symons, who previously had a hit with 'One Big Family' best known for its association with a recent KFC advert. Although Symons was nervous at times her performance of Rudimental's 'Powerless'; which she co-wrote, was different enough to get her a spot in the next round. The producers of The Voice UK are keen to show how there format is different from other talent shows who would definitely have put through cute sixteen-year-old Scot Stephen into the next round. However, in this instance, he didn't do enough for the quartet to press their buzzers although he did get rather a sweet letter from Rita. Another criticism I have of The Voice UK is that I'm not a fan of the way its filmed and there are certainly too many slow-motion shots for my liking. But overall I'm somebody who likes the programme and, unlike the majority of the country, I'll keep watching long after the chairs have stopped spinning. As always; Saturday night was a light entertainment battle ground so whilst The Voice UK attracted a solid audience, ITV brought out the big guns in way of a counter-attack. 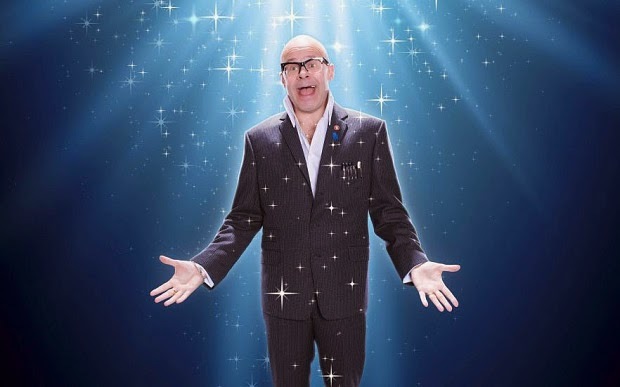 Unfortunately those big guns were comic presenter Harry Hill and a rebooted version of Stars in their Eyes. Most of us have memories of Stars in their Eyes being somewhat of a Saturday night institution in the 1990s however the key conceit of the show doesn't fit in with the cynical 21st century audience. Because of this, the karaoke part of the programme has been significantly reduced in favour of an odd sketch show featuring Hill's trademark humour. 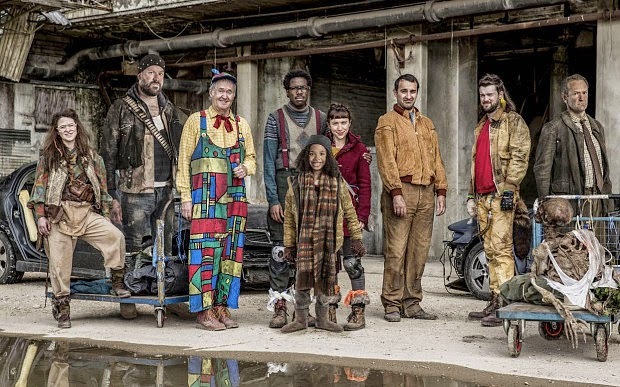 Hill has claimed that he didn't want to do any more TV Burps but it appears that he wanted to regress further as the sketch-show elements of Stars in their Eyes are reminiscent of his old Channel 4 programme. Bizarre moments included a comedy version of Adele turning up to confront Hill who'd put her baby in a drawer and also Hill's court jester Brian Belo appearing in a ball pool. It appears as if Hill feels quite embarrassed by his hosting of such a naff talent show so is almost making a mockery of the whole event. From poking fun at the contestants to making sure that we realise that the final of the show isn't live; Hill doesn't seem to particularly care about the quality of the singing and is happy enough just enjoying himself. I've been a massive fan of Hill's since his days on Channel 4 but even I have to admit that he looked like he was simply doing Stars in their Eyes for the money. I think anybody who watched the show on Saturday night realised that this wasn't Hill at the top of his game and I feel it won't be long until he reconsiders his decision not to revive his anarchic TV review show. Whilst Celebrity Big Brother continued to fine ratings across the week, the programme that accompanied it on Tuesday and Wednesday nights couldn't be any more different. When it first debuted last year; Channel Five's part-improvised police drama Suspects was met with critical acclaim and I personally felt it grew from its first to second series. As we enter series three, Paul Marquess has realised that we need to at least care about the drama's central characters and not just see them solving the crime. That's why it was interesting that episode one's story about an attack on a college lecturer coincided with the return from force leave of DS Jack Weston (Damien Molony). Weston returned just in time to console his friend DC Charlie Steele (Clare-Hope Ashitey) who'd realised that she could've prevented the attack taking place. But eventually it appeared that there was no time for recriminations as the victim soon died in hospital while one of her students later became a suspect. The raw style of Suspects makes it markedly different from any other crime drama currently populating our TV screens. Although it doesn't have the atmospherics of something like Broadchurch or the shooting locations of Death in Paradise; I felt the case presented by the writing team was a lot more compelling. Director Craig Pickles presented a sense of urgency as Weston and Steele made their way through the labyrinthine structure of the college in order to track down their suspect. I also feel that both Molony and Ashitey have grown in their respective roles and share better chemistry than they did in previous series. Meanwhile, the always reliable Fay Ripley strikes a commanding presence as the pair's boss DI Martha Bellamy. The semi-improvised dialogue gives Suspects a certain authenticity that is lacking in other programmes and I personally found myself caught up in the action. Presenting Suspects in four-episode long series means that the audience never tires of the drama and at the same time allows the writers to create new stories. Overall I was incredibly impressed with what the drama offered and will definitely be tuning in to see what Suspects offers up in its final two instalments. More interesting drama was provided courtesy of Channel 4's factual thriller Cyberbully; a real-time affair that took place in one single setting. That setting was the bedroom of Casey Jacobs (Maisie Williams), a typical teenager who is au fait with Twitter, Spotify and Vine. Cyberbully begins with Casey discovering that her ex-boyfriend has sent a hurtful tweet about her and she starts to plot her revenge. However, the person she thought was a hacker acquaintance of hers turns out instead to be an anonymous figure who stalks her for the rest of the hour running time. You wouldn't have thought that watching one teenage actress talking to a computer screen would make for such compelling viewing, but I for one was caught up in the action. One reason for that was Ben Chanan's frantic direction in which windows constantly opened up on Casey's computer screen revealing more horrifying truths about her. The script, which was based on real-life instances of cyber-bullying, felt realistic and Casey's interactions with her friends felt especially truthful. Meanwhile Maisie Williams gave a tour-de-force turn that proved that her brilliant performance in Game of Thrones isn't a one off. I can't imagine how hard it must be to interact with a computer for the length of a standard feature film, but Williams managed it beautifully and made the sometimes bratty Casey into a figure we cared about. The final scenes were particularly shocking as Casey was forced into committing a life-threatening act by the scary voice on the other side of the computer. During these scenes I found it hard to suspend my disbelief; but at the same time both Chanan and Williams tried to make this drama as realistic as possible. I think my only problem with the drama was that I found it hard to relate to Casey and therefore I found some of the decisions she made a little baffling at times. But I'm sure the teenage audience that Cyberbully is aimed at will identify with every facet of the piece. Indeed, I'm hoping that Cyberbully will start to be shown in schools as it presents a modern day moral message about being careful what you say online. You've got Jack Whitehall's character name wrong!